Note: the original version of this attributed the pick swap to GWS, not Fremantle. Each team wins this in their own terms. If used live, the picks would be better for North, but Freo have extra picks in this range and several before, so they clearly weren’t using all these ones at the draft. North gain the equivalent of about a free pick 56 to match likely bids for Tarryn Thomas and Bailey Scott who come as academy and father-son picks respectively. Sitting with picks 4, 28 and 67, St Kilda had more list spots (five) than they had viable picks. Even with Pierce and Marshall both probably meriting rookie upgrades, that means they’d be looking to take three live picks. 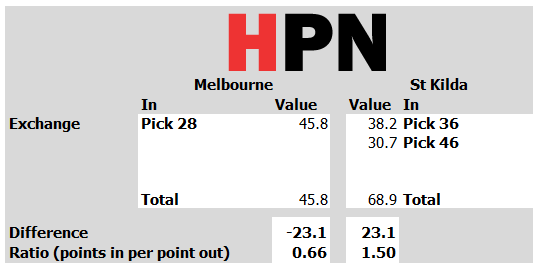 Given they delisted Maverick Weller nearly simultaneously with this pick swap, we could conclude that the Saints judged taking picks 36, 46 and 67 above retaining Weller on their list and using pick 28 and 67 only. Melbourne may be signalling a minimal engagement with this draft, leaving themselves with picks 23, 28 and 54 as the three mandatory selections right now. Interestingly, Melbourne have at least five list spots open right now – perhaps a sign that they might pounce on a delisted free agent or two, or look at some rookie upgrades. Verdict: Trade favours St Kilda.